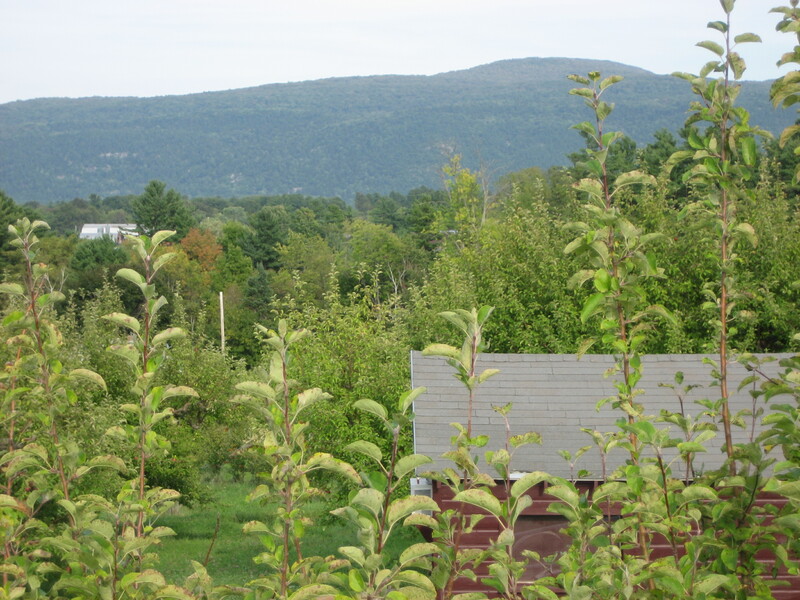 One of our favorite fall views, from the treehouse at Happy Valley Orchard. We’re sleeping with the quilt on almost every night. In the mornings, we wake to the sound of acorns crashing onto the roof as squirrels busily gather them from the oak tree. The sunlight has turned a deeper gold, and our eyes are peeled for new, colorful patches of foliage. Our second fall in Vermont is beginning. When our family moved from California to Vermont, everyone assumed that our biggest adjustment would be the weather. We lived in California for five years, which is certainly long enough to get used to the weather. The stereotype that California weather is 72 degrees and sunny every day of the year is both true and not true: California is a huge state, with great variance in climate. In Berkeley, where we lived, the average annual high temperature is 65 degrees, and the average low temperature is 50 degrees, which makes for a pretty mild year all around. Thereare seasons, but they’re so subtle that you need to watch carefully for them; Berkeley seasons have to do with the quality of the light, and with whether or not it’s raining. (Annual rainfall is 25 inches, but it’s limited to the winter months). Vermont seasons are not subtle – they pull out all the stops. Vermonters may have a reputation for being reserved, but not Vermont weather. Vermont’s average annual high temperature is 82 degrees, and the average low is 10 degrees. Average rainfall is 35 inches, but average annual snowfall – a statistic that doesn’t exist in Berkeley – is 66 inches. So, when our friends predicted that weather would be the biggest difference between the Bay Area and Addison County, they were right – both in terms of the weather itself, and in how weather defines the people and culture of a place. Weather affects everything. For instance, I firmly believe that a major reason Californians are considered laid-back by the rest of the country is because of California weather. Mild temperatures, plentiful sunshine, and subtle seasons make everything easier. Californians can get away with the same wardrobe of jeans and t-shirts year-round. Utility bills are predictable and consistent. And weather is rarely a factor when it comes to planning outdoor activities. That about sums it up. You’ve GOT to be manic and running around during Vermont summers, and not just because that’s the only time of year when it’s truly comfortable to be outside; it’s also the only time of year when the outdoors isn’t blanketed by leaves, snow, or mud, so anything that needs doing on your house or yard has to happen in the summer. By late summer, you’re busy preparing for winter: canning summer fruits and vegetables, stacking wood, bringing in potted plants and deck furniture, and taking stock of your winter wardrobe. Once upon a time, this summer mania was necessary for survival; being too laid-back during the summer meant you’d freeze or starve when winter hit. Nowadays, it’s more likely you’ll end up with snowy deck chairs or too-tight boots, but the seasonal urge to prepare is still deeply ingrained. So, which is better? The subtle, mild seasons of California? Or the dramatic seasonal variety of Vermont? The answer, of course, is that both are lovely, but in different ways. California’s weather is as close to heaven on earth as I’ve experienced, and I now realize what a gift it was to have three babies in a place where we could walk to the park and play outside EVERY DAY, without bulking up in coats and boots. I’m equally thrilled that our girls now get to jump in leaf piles, learn winter sports, and – yes, really – play in the mud. But you know what’s funny? In California, the stores still carry fake autumn leaves in the fall, and snowy holiday decorations in the winter. Californians decorate their homes with seasonal trimmings that bear no resemblance to the reality outside their windows. I don’t think this is just clever marketing; I think it’s because many people so crave the change of seasons, that they’re willing to purchase a fake alternative if the actual seasons don’t really change. Change can feel jarring and tiring, but it’s also the natural way of things. We all need times to run around outside like maniacs, and we all need times to hunker down inside and reflect. Seasons are nature’s way of permitting us to live lives of balanced change. Now, if only I can keep that perspective while raking leaves and shoveling snow over the coming months. Faith Gong has worked as an elementary school teacher, a freelance photographer, and a nonprofit manager. Since moving to Addison County in 2011, her work has involved caring for a house in the woods, three young daughters, four laying hens — and writing for her blog, The Pickle Patch.